The government of Venezuela will celebrate the legacy of its late socialist president Hugo Chavez this month at a coffee shop owned by a radical Washington, D.C., mayoral candidate who has said Israel controls U.S. foreign policy. The Venezuelan embassy will host an event on Feb. 26 at a downtown D.C. franchise of Busboys and Poets, a local chain of coffee shops. 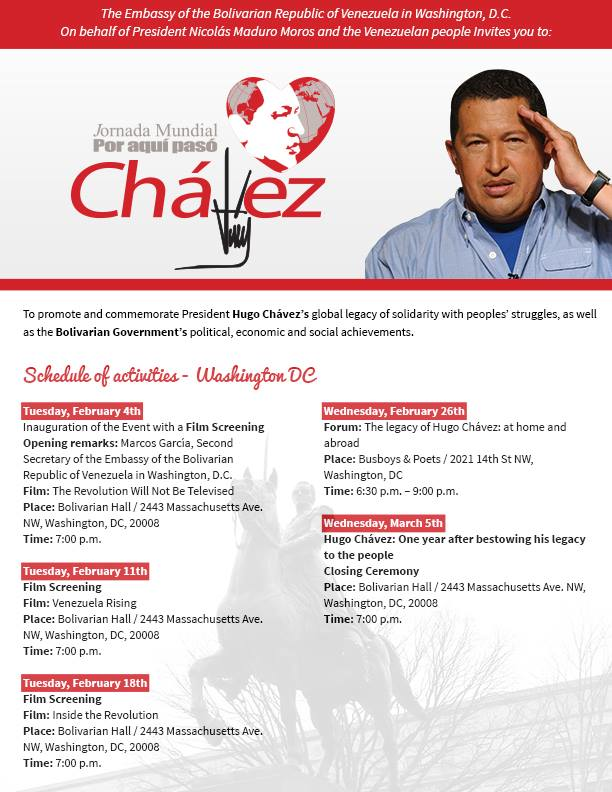 The event will celebrate “the legacy of Hugo Chavez at home and abroad,” according to promotional materials obtained by the Washington Free Beacon. Busboys and Poets is owned by restaurateur Anas “Andy” Shallal, an Iraqi-American who is campaigning for the Democratic spot on the ticket in the mayoral contest in Washington, D.C., later this year. The upcoming Busboys and Poets forum is one of a series of pro-Chavez events throughout Washington sponsored by the Venezuelan government. Three of the events are screenings of documentaries laudatory of the Chavez regime, which was widely criticized by international human rights observers. Shallal serves on the board of a left-wing think tank, the Institute for Policy Studies (IPS), that has promoted two of those films, Venezuela Rising and Inside the Revolution. The event promoting the former also included an address from Marcos García Figueredo, then a secretary of political affairs at the Venezuelan Embassy. García Figueredo is now the country’s ambassador to the United States and will give the keynote address the kickoff event of the pro-Chavez campaign in D.C. this month. IPS has given a platform to a number of Venezuelan government officials, including former ambassador to the United States Bernardo Alvarez, whose visa was revoked by the State Department in 2010. Two IPS employees have donated to Shallal’s campaign. He has also received contributions from an employee of a group called Just Foreign Policy, which also supported the Chavez regime. Shallal is a longtime left-wing activist who vehemently opposed the Iraq war, even joining a protest outside of then-President George W. Bush’s Crawford, Texas ranch. He is also an outspoken critic of Israel and a conspiracy theorist who believes the country dictates U.S. foreign policy. “The U.S. and its allies sit on the side, getting marching orders from Tel Aviv,” he said at a 2007 event held by a group called Iraqi Voices for Peace. “This is a plan to create to a new American-Israeli century, and those who dare to speak out will be squashed, a century where the military will continue to call the shots, and where Israel, America’s largest arms depot, will continue to control and terrorize the region,” Shallal said. Washington political observers previously told the Free Beacon that Shallal is probably too radical even for the deeply Democratic electorate in Washington. Busboys and Poets has hosted other radical elements in the past, including domestic terrorist Bill Ayers and a 9/11 “truther” group. Shallal’s campaign did not respond to a request for comment.